We were supposed to go to Koo Zee Doo with friends on sunday. We even made reservations and everything, like grown-ups. Then J got sick and those plans had to get thrown out. When he started feeling better, we made an impromptu trip there. No reservations necessary on this week night. It seemed to be about half full, and we got a prime spot right in front of the big window. It’s an adorable little portuguese byob. 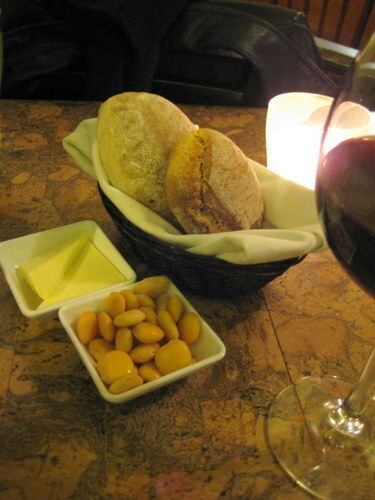 Some complimentary brine soaked lupini beans, and two different breads, baked in-house. One is a somewhat soft wheat bread and the other is a very hard and crusty cornbread, called broa. Everything was excellent. The beans are super salty! The cornbread tasted a bit like corn pops in my opinion, but it wasn’t overly sweet at all. We didn’t b our own b, so they offered us some complimentary house wine. I partook. It was delightful. The food here is family style, so they recommend two people to get two starters and share an entree. So we followed their lead and did just that. 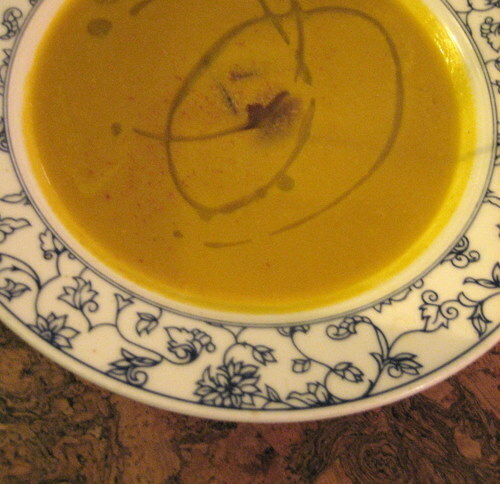 J wanted the carrot and chestnut soup. It’s hard to describe what this tasted like, as it did not taste very much like carrots, nor did it taste very much like chestnuts. But we both liked it. The soup was smooth, except for a few hunks of something that we thought could perhaps be purple pearl onions. As mysterious as it was, we enjoyed it. 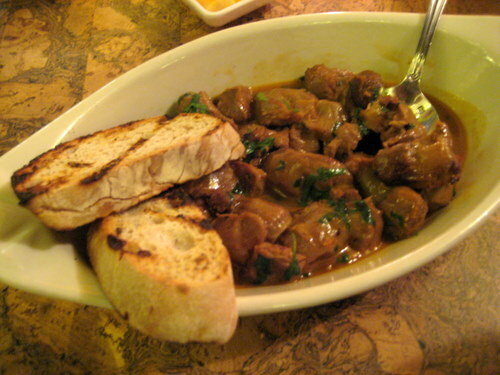 I really wanted to be a bit more adventurous, so I picked the braised chicken gizzards as our other starter. Man, was I glad I did. These things were so good! These don’t have a strange texture at all. It just feels like plain ol dark meat chicken. They’re braised in something absolutely delicious, and when the gizzards are plopped on top of these pieces of crusty toasted bread, it’s pretty f’in good. I loved this. J was totally afraid of them at first, but he ended up liking these gizzards too. For our entree, we got the baked duck rice. 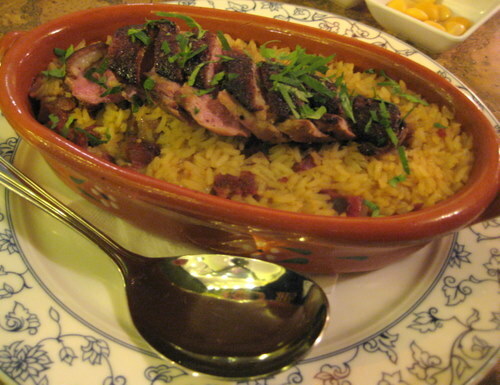 Rice was baked with shredded duck leg and chorizo, and there is also sliced duck breast on top. The rice was fairly mild with the duck pieces being delicious and juicy. The chorizo was incredibly smoky and flavorful. And the duck on top? Oh. My. Word. So damn good. So damn, damn, damn, damn good. Service was nice and friendly. The only awkward part was that in the front where we were seated, it’s raised up a bit, so when we were getting our food, the server had to reach up and around a bit from the ground level where he was. It was just a bit difficult to maneuver. It has an open kitchen too, which I love. It goes to show that they’re not afraid of showing the diners what’s going on in their kitchen. The prices are reasonable when you order only one entree, but as a whole, it’s rather expensive. Most of the entrees are $25 plus, which is certainly expensive in my book. But because of the sharing and the large portions, it ends up being just fine. Very impressed with the depth and intelligence with which this blog is written. Pictures are gorgeous and making me very hungry. 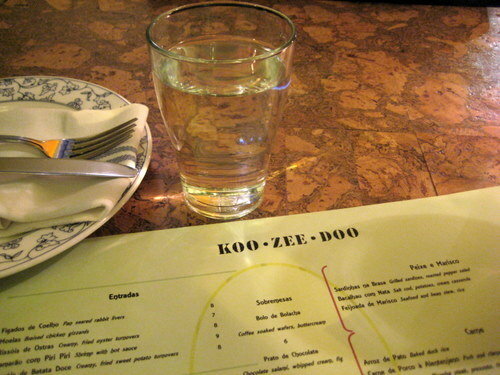 Going to KooZeeDoo this Sunday nite for my birthday, so your review piqued my interest. More eager than ever! One thing – I agree with your Mom – I can’t stand cilantro!! Keep up the great work. Excellent report! Great pics! We also enjoyed the gizzards immensely and had to coax our squeamish dining partners into trying them. We were seated at the far-end of the dining room and were eying that front-window spot…it looked cozy enough, glad to hear that was confirmed. I wonder how many bells they’re going to ring up this Sunday? if he doesn’t like this place, he’s crazy! the whole place is just adorable, and the front-window spot is great! we just lucked out… i keep thinking about those gizzards!